Another year older and better than ever!! Stampin' Addicts is 3 years old now! And to celebrate, everyone on this hop has done a different party theme. I am stop #5, so you may have just arrived from Heidi's blog where she did a Rapunzel Birthday Party. That woman always blows me away with her creativity, so I am feeling a little intimidated today :) Leave her some love! So let's see if I can wow you with my Girls' Night theme. I could have gone many ways with this, but I chose to use colors that match the walls, I mean the insulation sheets (roll eyes), in my kitchen, which are just a titch lighter than Daffodil Delight. Think banana yellow, since I am looking at the bananas sitting right next to my wall and they almost blend in.... This is a bit of a challenge to make things look good for a party. I mean yellow is not exactly a neutral color. Oh, and I do have white salad plates, and yellow salad plates, which will fit nicely in the 3 tiered goodie rack I bought before Christmas. I plan on making some carrot cake cupcakes, some Sweet Pressed Shortbread cookies with the flower stamped on them. So let's start with the invitation! If you have followed my blog for very long, you know I love all things Crumb Cake, including the packing paper that comes in the SU orders :) I discovered that you can easily punch through 4 layers of it at once! This flower takes 8 Blossom punches to complete, and it is so full and lovely! Now, the Raining Flowers set is one we got at convention, and I really wasn't sure I liked it at first, but it has definitely grown on me. I like the modern feel to it and the endless combinations you can do with it. The sentiment is from Hugs & Wishes, which is only available on MDS now. The first project I did was actually this banner. This is only 1/4 of the banner, I couldn't get a good picture of the whole thing as it is hanging above my 5 foot wide kitchen window. Way too distracting in a photo. The centers of the flowers are all buttons and glimmer brads. I figure when I am done with the banner, I can reclaim them to use on another projects! The white flowers are 6 layers of White Waffle paper punched with the Fancy Flower punch, and the yellow is 4 layers of Faux Sueded Daffodil Delight cardstock punched with the 5-Petal Flower punch. Now these are for popcorn in my mind, but could hold all kinds of things. When I think Girls' Night, I think drinks, cupcakes, cookies, cheese and crackers, popcorn, and movies. These are paper lunch bags cut with the Adorning Accents Edglit and then embossed with the coordinating embossing folder. I found that you can cut and emboss 2 bags at a time! And each one is slightly different so you can tell which one is yours :) Imaging having those flavored popcorn sprinkles for everyone to customize their fresh buttery popcorn, yum! I had to make a wine tag. They just look so fun! Come back next week and I will tell you how I made it. Super easy. The sentiment is from Pursuit of Happiness and it just goes so well with the vibe of this theme. And I just had to do some coasters. I have gobs of blank ones in my stash, and they take ink so well, I couldn't resist. I think it too me about 10 minutes to do these 4. Now I can't wait to have a Girls' Night party!! All I need to do is pick a date and call the girls! ANd hope I can find a night most of us don't work, lol! On to the next hop where Lisa is going to show us a FABULOUS bridal shower theme! Boy, I tell you it is tough to be stuck between these two because they are sure to outshine little old me! Yes, I can be clever, and make some cute stuff, but these ladies are such inspirations to me! This is #2 of my swaps for the birthday card swap at Stampin' Addicts that I did recently. The category for this one is MASCULINE. For some reason, saddle stitch ribbon and buttons are very masculine to me. I don't know why. Woodgrain and blocky letters fit in there too. To create the dovetail on the banner, I measure up 1" from the bottom and pencil marked a dot in the center, then cut from each corner up to the dot with a scissor. I stamped all of the hot air balloons on this card, but it really did not take much time at all to do. Wow! It's time for a new event already!! 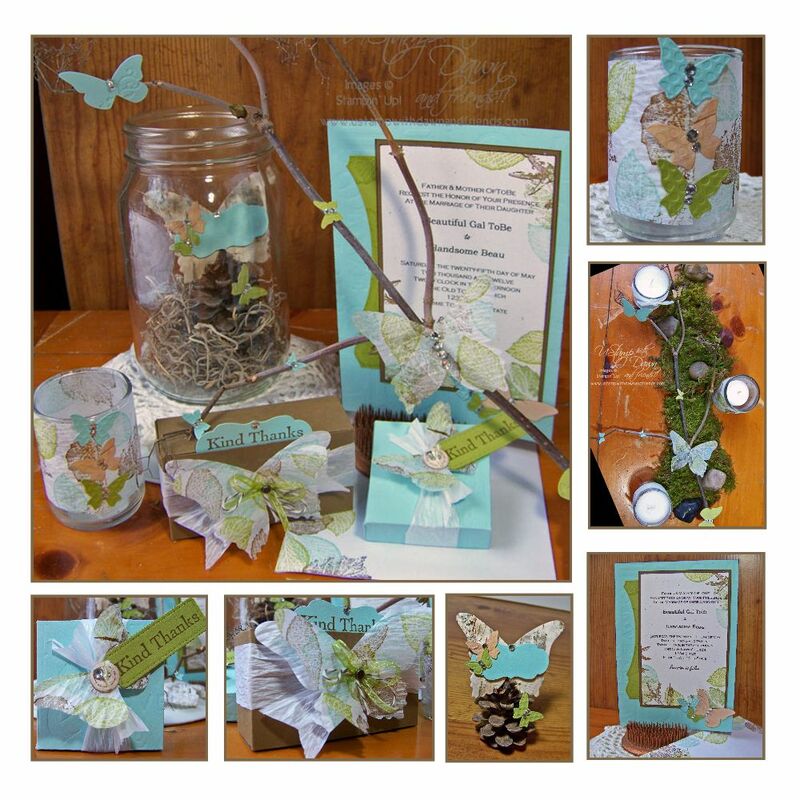 I designed another fun project for UStamp, and this time I went crazy with the butterflies! The tutorial for my project was posted on the Big Shot Round Up event on 2/16/12. Go check it out! Doesn't this look fun? One of my girlfriends wants me to make this for her niece's wedding in Montana. I think that would be perfect!! I was not as prepared for Valentine's Day as I should have been this year. I had quite a stash of cards to sell at work last year, but not this year. Oh well. One of my co-workers did come to me last weekend and told me she needed 4 cards. One of them would be for her adult son. She has been getting cards from me for about 3 or 4 years now, and her son had made a comment about them a couple years ago. He told her that she was finding the most amazing cards! I used to think guys didn't notice this stuff, but even the guys at work want to use my cards because they are "special" and "little works of art". Now, I don't let that go to my head, because I know that I am not the most talented card maker out there. Not by a long shot! But who doesn't love some admiration of their efforts?! I really think the Letterpress Plates are missing out on the love from most of us. They are such and awesome tool, and I love the look they give. I find myself using them just as much as the embossing folders. Check out the "son". It is form the Family Reunion set, which I earned with my sales during Sale-A-Bration last year. I love being a demonstrator :) So many great perks! There 24 stamps in the set, and 19 of them are family relation names! Bet you didn't know there were that many to use! The birch button was cut using the Buttons #5 sizzlit. You do have to peel the birch bark to a couple layers thick for this to work, but the results are awesome! And if you are like me, and burn wood to heat the house, then you don't have to go far to find birch bark. Otherwise, you can find it online in lots of places. Or maybe you know someone else that has some you can use. And Tombow liquid glue holds the birch bark just fine!